I’ve been a teaching assistant twice for a two-semester survey of the history of western medicine offered at the Johns Hopkins University. The full sequence takes undergraduates from Hippocrates to Obamacare, with the second semester covering the Enlightenment to the present. One of the pleasures of teaching a discussion section during the second semester is that it allows me to explore the history of our own institution with a group of undergraduates, many of whom themselves hope to work in healthcare and perhaps to study medicine at Johns Hopkins. 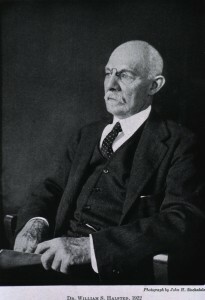 William Halsted. Source: National Library of Medicine, IHM. 101417923. A key, fascinating figure in the early history of Hopkins–and one who bridges central course themes as we shift from the early modern, to the modern, to the contemporary–is William Halsted. He was one of the “Big Four,” a brilliant surgeon, an accidental cocaine addict. Halsted is well known for his role in the history of mastectomy, and in this as in other areas of his career he can illuminate these themes for students. His life and career, for example, epitomize the promises and perils of developments in nineteenth-century surgery. I also believe that the history of radical mastectomy has particular power for many because the tensions that the measure introduced into the lives of sufferers continue to be recognizable in our own. We all have friends and family who have suffered from and with cancer and cancer therapies, and many have faced decisions over difficult breast surgeries. These tensions also persist at the level of public policy. For instance, just in the last few days, as I was preparing this post, I listened to a contentious panel discussion on the American public radio program “The Diane Rehm Show” about routine mammography. I don’t want to suggest that our and our loved ones’ medical experiences are in any way the same as Halsted’s patients’, much less those of early modern people who contemplated going under the knife, but I do want to suggest here that making such connections may help us and our students think about and empathize with historical actors who often seem very foreign from us. Recipe books might seem like poor sources for doing this, but if we look closely I think that there is in fact evidence of a great deal of emotion and drama. It is visible, for instance, in recipes that heal breasts, especially breasts threatened by dire maladies and consequently surgeons’ tools. Halftone of Bodleian Library window. Source: National Library of Medicine, IHM. 101409068. 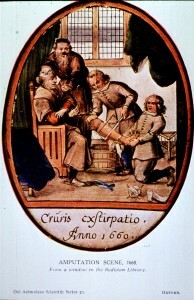 As scholarship such as Lucinda Beier’s on the London surgeon Joseph Binns has shown us, workaday early modern surgeons did not perform much invasive surgical work.1 Opening the body and reaching into it with tools and chemicals was usually a last resort, but it was one some surgeons and sufferers were willing to undertake. Operations like craniotomy, lithotomy, and, of course, limb amputation are the best known pre-modern measures. Surgeons also sometimes cut into afflicted breasts, removing portions of breasts or even amputating them entirely. Richard Wiseman. Source: National Library of Medicine, IHM. 101432120. I am very interested to know whether you’ve found similar sorts of material in recipe books that might give evidence of therapeutic preferences. 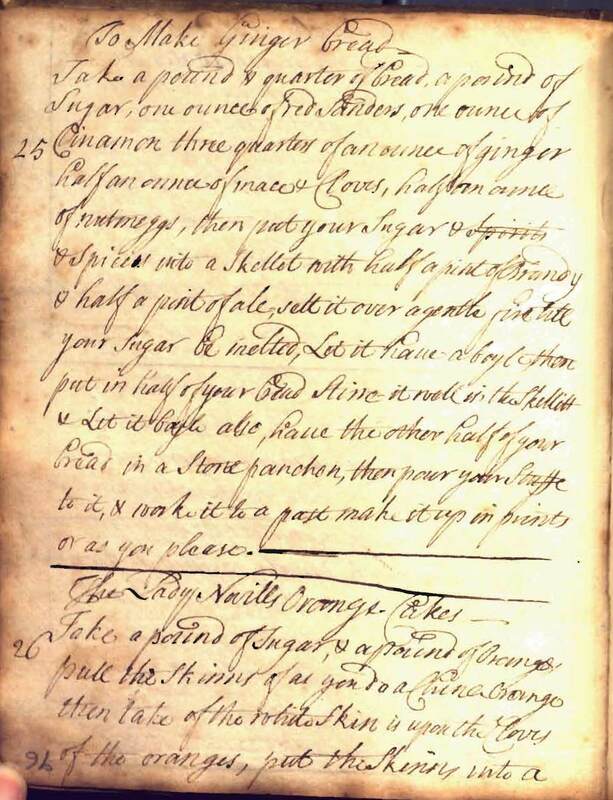 I’m also interested in how recipes (these sorts and others) have been or could be used in teaching the history of pre-modern medicine, especially to students in survey courses. In my favorite activity from the first half of our survey, we give groups of students a selection of seventeenth-century medical advertisements and ask them to think about what the advertisers were offering, how they offered it, and why it may have been appealing to consumers. Would it be possible to design similar sorts of lessons using selections from recipe collections? How else can we use collections and recipes in the classroom, especially when teaching students that are new to early modern history and working with primary sources? 1 “Seventeenth-Century English Surgery: The Casebook of Joseph Binns,” in Christopher Lawrence (ed. ), Medical Theory, Surgical Practice: Studies in the History of Surgery (London: Routledge, 1992): 48-84, and Sufferers and Healers: The Experience of Illness in Seventeenth Century England (London: Routledge & Kegan Paul, 1987), chp. 3. 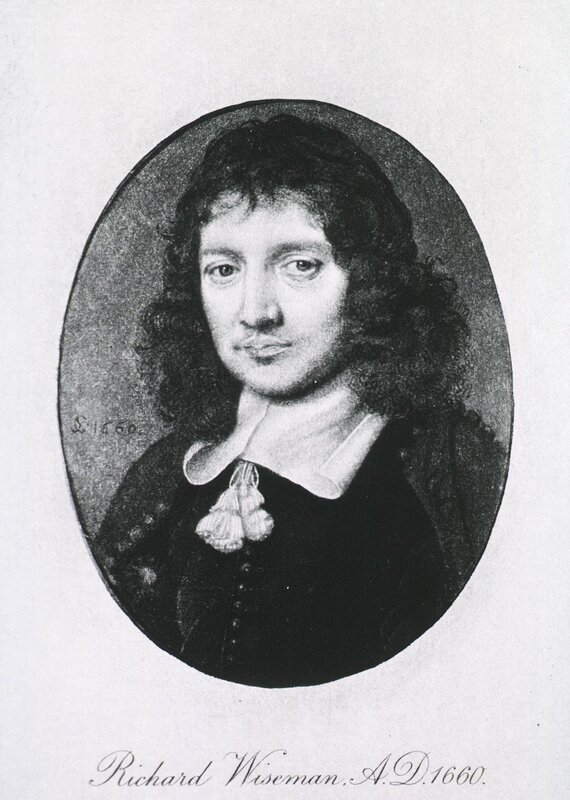 2 Michael McVaugh, “Richard Wiseman and the Medical Practitioners of Restoration London,” Journal of the History of Medicine 62 (2007): 125-40. He briefly discusses this case on 133-34. 3 Eight Chirurgical Treatises, 3rd ed. (London: for B.T. and L.M., 1697), Wing W3106A, pg. 108-109, “Observat. of a Cancerous Breast cut off.” Phil. Trans. 8 (1673): 6039. Italics removed. 4 Wellcome MS 4338, fol 18v. I’ve modernized the spelling here. 5 For instance: Andrew Wear, Knowledge and Practice in English Medicine, 1550-1680 (Cambridge: Cambridge University Press, 2000), 271. 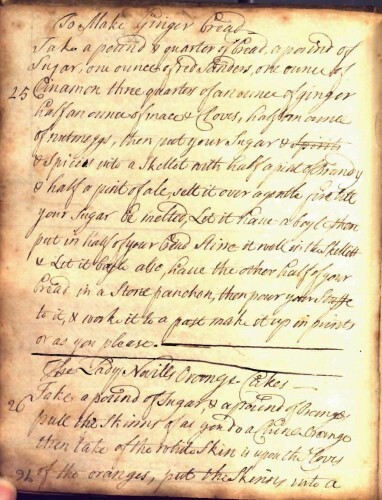 Johanna St. John’s recipe book contains many interesting and unusual recipes on the treatment of madness, melancholy, and fits of the mother early modern. These recipes offer clues to the domestic understanding of mental illness and its causes. There were very few similarities between the recipes in St. John’s book, suggesting that although there were only a few early modern categories of psychological disturbances, there was wide variation within each category. This has led me to discover some “fishy” recipes for the treatment of madness and melancholy that are certainly questionable as to their success. The domestic treatment of mental illnesses is an interesting point of study for seventeenth-century England, because the care of the mentally ill was left to their family and friends. Asylums before 1700 were relatively small, rare, and expensive (MacDonald, 262, 266). So what did people think caused mental illness? The herb borage, used for fevers and to comfort the spirits, was the only repeated ingredient used in two recipes for melancholy. As well, the recipe “For vapors euen to Madnes” calls for powder of holly leaves, used for the treatment of fevers. Fevers and psychological afflictions were thought to be linked. In a recipe “For Melancholly and madnes”, the main ingredient is ivy or ale-hoof, used for spleen ailments and melancholy. This suggests melancholy and spleen problems were connected. According to early modern medicine, physical ailments in one area of the body might affect an entirely different area (Wear, 134-135). A Tench. Engraving by R. Carpenter after C. Hardy. Credit: Wellcome Library. One particularly strange remedy is literally fishy. “A medecine For Madnesse”, if taken in time, requires a fish (specifically the tench) to be cut open, rubbed with mithridate and tied around the neck, “guts and all”. Although more of a mystery as to what exactly the benefits of such a treatment would be, there is some suggestion of a belief that inanimate objects would allow the transfer of the illness away from the person and into the object. 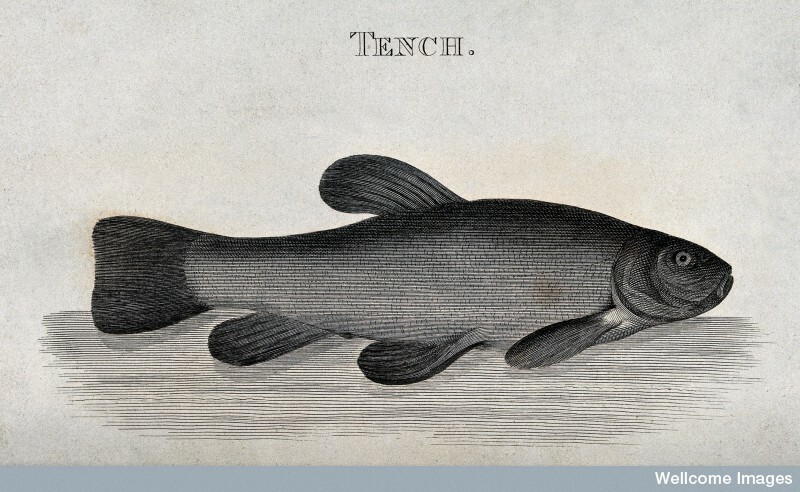 As well, the tench, also known as the “physician fish” supposedly had magical properties in its slime (OED). This wide variety in the domestic treatments for madness and melancholy provides insight into how early modern people understood and treated mental illnesses. As well, these recipes indicate that individuals suffering from mental maladies were regularly treated at home. Today we would most certainly not treat depression by tying a fish, guts and all, around the neck, but our own understanding of mental illnesses is far from complete. Perhaps hundreds of years from now our methods may seem just as “fishy” as those used in the early modern period. “Culpeper’s Complete Herbal Alphabetical Index.” Complete Herbal. http://www.complete-herbal.com/culpepper/completeherbalindex.htm#b, 2010. Lindemann, Mary. Medicine and Society in Early Modern Europe. Cambridge: University Press, 1999. MacDonald, Michael. “Women and Madness in Tudor and Stuart England.” Social Research 53, 2 (1986): 261-281. “Tench, n1.” The Oxford English Dictionary. 3rd ed. 2002. Wear, Andrew. Knowledge & Practice in English Medicine, 1550-1680. Cambridge: University Press, 2000.